The growing amount of evidence suggests that the police were under orders to shoot the undertrials and not re-arrest them. 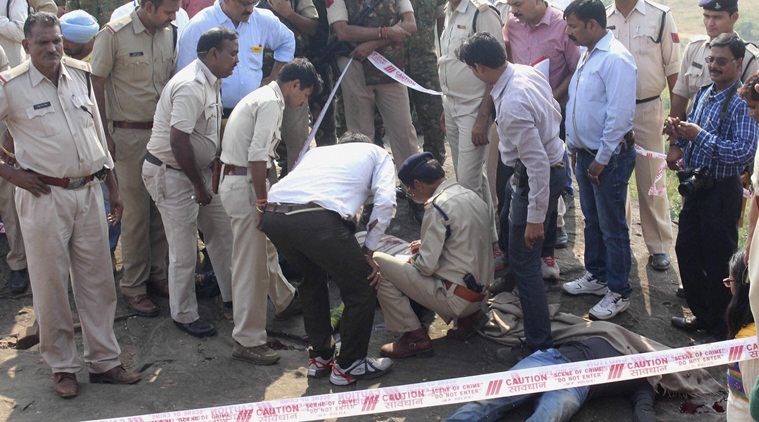 Two audio tapes said to contain recordings of conversations between the policemen who shot and killed eight SIMI members, who has escaped from a prison in Bhopal, have raised more questions about the police’s claims that the deaths were a result of an encounter. The tapes and the videos of the interaction between the policemen and the escapees, which surfaced the day after they were killed, add to a growing amount of evidence that suggests the police were under orders to shoot the undertrials and not re-arrest them. Men can also be heard saying that firing from the other side has started and that they should take positions, signalling that the escapees may have fired at the police from their position on top of a hill in Eintkhedi village on the outskirts of Bhopal where the police eventually cornered them, the Hindu reported. It appears the tapes are recordings of the communication between the control room and policemen on the ground who were in pursuit of the SIMI members. On the tapes, some police officers are referred to by “standard codes like Mic1 and Mic2”, the Indian Express reported. The voices in the tapes seem to congratulate each other and celebrate after all the men have been shot, “Surround them from all sides. They should not escape alive… Congrats aantho mar gaye DSP Crime ne bataya. Very good… beech mein pade hain (Congratulations, all eight have been killed, DSP Crime has said. Very good. The bodies are lying in the middle),” the voices are heard saying, according to the Indian Express. While the Hindu reported that the tapes have not been verified as yet, in a more recent report the Indian Express quotes Superintendent of Police of the CID Anurag Sharma, who is heading the investigation into the operation as saying, “We will include everything in our investigation,” implying that he does not question the authenticity of the tapes, although he also told the paper that he had not heard the tapes yet.